Today is Amy’s birthday – which means that I’ve been helping the kids with present making. Grace’s idea for a homemade birthday card was particularly geeky, so I thought it was worth a quick post. The idea was that she’d design an e-card, and record a variety of voice clips, which would be played when you clicked on various bits of the card. She did after-school French lessons last term, and she hears some Greek from my mum, so she’s kind of interested in the idea of other languages. So we came up with the idea of a card with a Happy Birthday message in lots of different languages. It turned out that my multi-lingual efforts to assist her were a bit lame, so I convinced her to scale it down from “Happy Birthday” in dozens of languages to “I love you” in nine langauges. 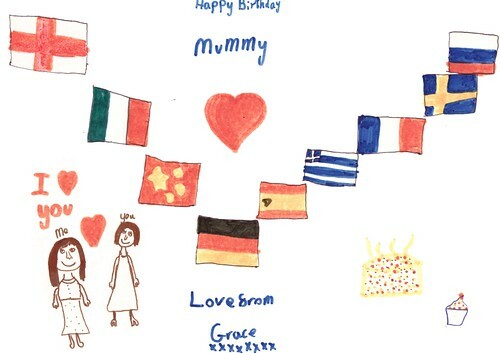 We settled on a design with a bunch of flags – clicking on a flag plays Grace’s voice saying “I love you” in that language. It looked like this, but click through here for the live version. It was pretty simple, but I thought I’d share a few comments about how we did it. I have a lot of digital photos. An insane amount – something like 40,000 photos that go back over a dozen years since I first got a digital camera at University. 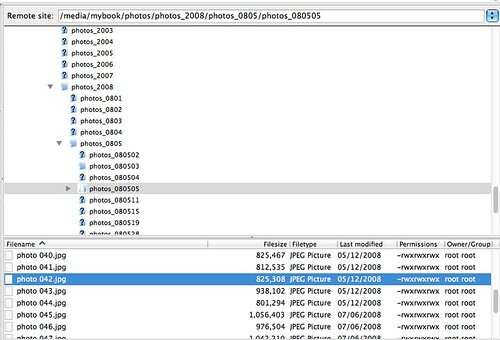 For a while, I used to drop a readme.txt text file into some of the folders saying where the photos were taken or what I was doing. This was partly so that when I look at the photos ten years later I’ve got something to remind me what is going on, but mainly to make it possible for me to search for photos of something when I can’t remember the date it happened. But in recent years, I’ve been too lazy to keep that up, and rarely ever add a readme file. I thought that my tweets might be a good alternative. There is a reasonable chance that if I took a photo of something interesting, that I might have tweeted sometime that day about where I am or what I’m doing. I wanted to populate each of my folders with a day’s photos in it with a tweets.txt text file containing tweets posted on that day.